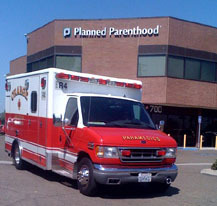 Planned Parenthood Keystone had a novel excuse for failing to report the ambulance transfer of a patient to the Pennsylvania Department of Health, as required by law. 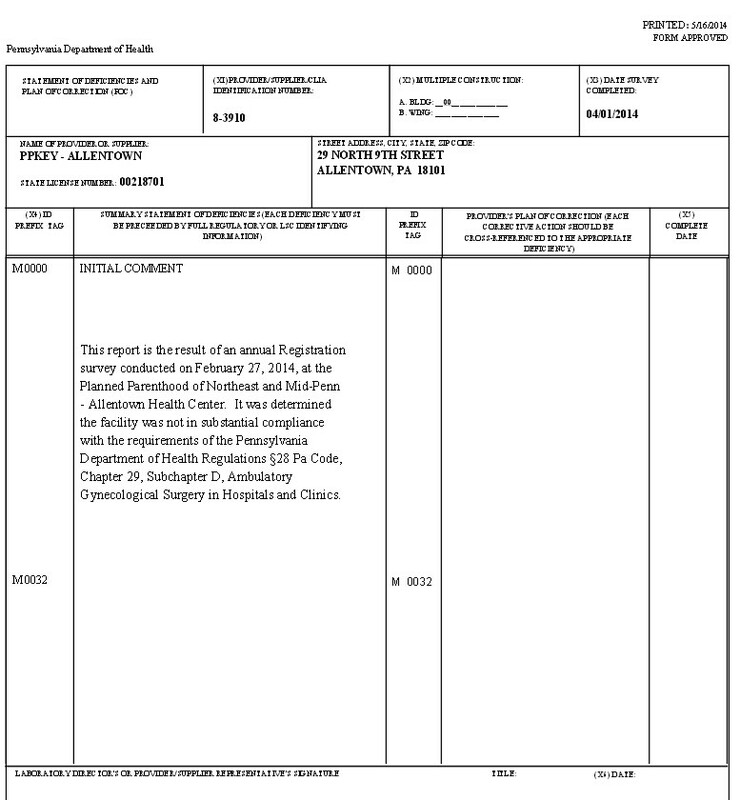 When DOH inspected Planned Parenthood Keystone’s Allentown abortion clinic on February 27, 2014, it was surprised to learn a patient had begun hemorrhaging after her abortion on March 15, 2013, and taken to the hospital by ambulance. This was a surprising because DOH is supposed to get a report from any medical facility within 24 hours after such an occurrence, and it didn’t in this case. Its Patient Safety Officer and Associate Medical Director “determined that this event did not constitute a serious event or incident…. Abnormal bleeding after a surgical abortion is not unusual nor is it unanticipated,” quoting from the report. The Health Department report reads: the patient presented to the facility on March 15, 2013, for an elective in-clinic abortion. CF1 performed internal suction and documented no products of conception were found. CF1 requested an ultrasound be performed. Further review revealed CF1 documented the patient’s uterus was empty. CF1 completed a second internal suction of the patient’s uterus. CF1 documented no products of conception were found and requested a second ultrasound be performed. CF1 documented no products of conception were found. Continued review of MR6 revealed the patient began with excessive bleeding with noticeable large clots. CF1 instructed CF2 to administer Methergine (medication used to manage hemorrhage) 0.2 milligrams (mg) intramuscularly (IM). The patient’s excessive bleeding continued and CF1 instructed EMP3 to call 911 to request ambulance transport of MR6 to the hospital’s emergency department (ED). conception found. Continued interview confirmed the patient had excessive bleeding, was given Methergine, and transferred to the hospital ED for excessive bleeding following an in-clinic abortion. 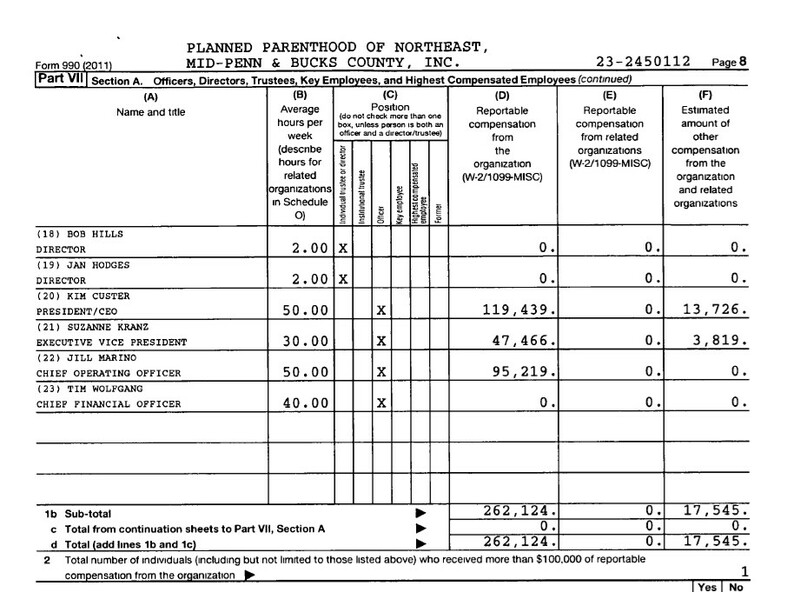 In 2013, Planned Parenthood of Northeast, Mid-Penn & Bucks County and Planned Parenthood of Central Pennsylvania merged and the new entity is called Planned Parenthood Keystone. 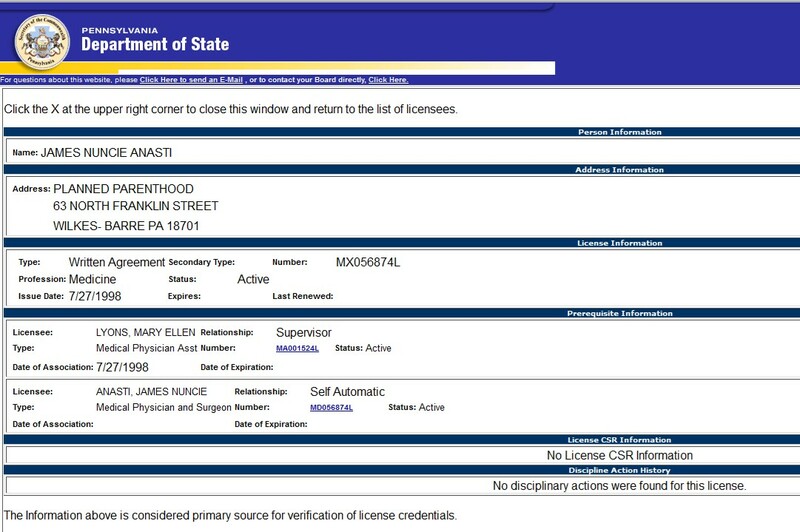 According to a report they uploaded online the Planned Parenthood of Northeast, Mid-Penn, and Bucks County Planned Parenthood Central medical director is James Anasti, MD. This entry was posted on May 20, 2014 at 4:09 pm and is filed under 911 calls, Abortion, Abortion Bleeding, Abortion Clinic Inspections, abortion clinic safety, Abortion Clinic Worders, Abortion complication, Abortion injury, Abortionist, Planned Parenthoo Parties, Planned Parenthood abortionist, Planned Parenthood Ambulance, Planned Parenthood Employee, Planned Parenthood fined by state, Planned Parenthood inspected, Planned Parenthood Investigated with tags 911, abnormal bleeding, Abortion complication, Allentown, ambulance, bleeding., hospital, inspection, James Anasti, Jill Stanek, MD, Mid-Penn, Planned Parenthood Keystone, Planned Parenthood of Central Pennsylvania, Planned Parenthood of Northeast, PPKey. You can follow any responses to this entry through the RSS 2.0 feed. You can leave a response, or trackback from your own site.